I started writing Song of Simon near the end of 2009. I was working as a long-term substitute teacher for troubled teens and a music journalist at the time. The novel was born when these two aspects of my life came together. I had grown weary of both jobs. Teaching is an exhausting, thankless job, and subbing is even worse. The students already had behavior issues (many were in and out of juvie or living in group homes). I was breaking up fights on a daily basis, and could do little to control the class. Students know that subs have no real authority, and they take advantage. I enjoyed music journalism at first, but as it went on, I realized that it was nothing more than a quid pro quo job. On the bottom end, the artist gave the writer free tickets, swag, etc, and expected a good review or puff piece in return. On the top, the editor encouraged the same . This was because a good review would get passed around more and increase page views. I accepted that this was the way of the business, but I wasn’t happy with it. Instead, I started writing more Music History articles to go along with reviews. At least I gained some joy from those, but it wasn’t enough. If there’s one thing I’ve learned about myself, it’s that I’m never satisfied. The hardest part of working with my troubled students is learning about their lives and what they’ve gone through. So many were physically, emotionally, and sexually abused. Living in a group home pretty much ensured some kind of sexual assault. I thought about what their lives would be like if they grew up in normal homes, free of violence. I thought about how violence changes a person into something that they shouldn’t be. PTSD is real, and though we usually associate it with war, it can happen to anyone. Children are very susceptible, and it broke my heart. I decided that I wanted to write a fantasy novel that explores the trauma of violence. Fantasy was the perfect medium for it, as I already knew I had a talent for writing action scenes. Standard fantasy tropes have tons of violence, but characters rarely feel the emotional heft of hurting and killing another person. Monsters are often stand-ins for “others,” people “not like us,” and they’re killed without a thought. I wanted my characters to feel that pain, and they do. Each character responds differently: some become hard and unfeeling, others succumb to the emotional scars, and some find a way to rise above. Song of Simon may look like a standard Sword and Sorcery piece, but I went deeper. Of course, the main character evolved into a musician. Writing 3-5 articles a week about music ensured that. At first he was going to be a rocker, but I thought that too cliché. Instead, I gave him a love of blues and folk music. It seemed more appropriate. Rock music is about having a good time, but folk and blues are about hard times and suffering. These were going to be very hard times for Simon. The songs in the novel reflect that. Song of Simon wasn’t the first novel I ever tried to write (the first was for an undergrad class. I was 9 chapters in when the class ended, and the novel is lost on an old disk somewhere) but it was the first in 10 years. Not that I was an amateur. Between short stories and articles, I was already an accomplished writer. Still, I struggled, and between everything else in my life, it took 3 years to write, edit, rewrite, edit, rewrite, edit, rewrite, and proofread (I told you, I’m never satisfied). I went the traditional route with Song of Simon. First I sent it to agents. Not only did they not bite, they took months to reply (if at all). Then I decided to go straight to indie publishers. Damnation Books bought Song of Simon in February 2013, just days after my girlfriend Valerie suddenly passed away. I was at the low point of my life. I should’ve been happy about a publishing contract. I wasn’t. You see, trauma is real, it changes you, and losing Valerie changed me too. I was deeper in Simon’s world than I ever expected to be. So what’s in the future for Simon and his friends? I’d like to finish up the series eventually, though I’m pretty immersed in The Watchmage Chronicles (working series title) right now. I have 3 Watchmage books lined up, then I’ll get back to Algavar and finish what I started. It might take 3 or 4 years, Simon will get the ending he deserves. Song of Simon is just the first verse. Like my posts? Follow my website or “Like” my facebook fan page and/or follow me on Twitter. 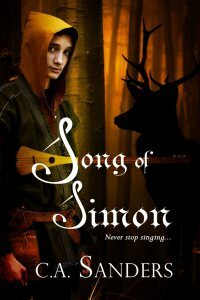 You can also purchase my debut novel, Song of Simon, at any online bookstore or a real one (they both exist). Song of Simon currently has a 4.7/5.0 rating on Amazon, so it’s pretty damn good. If you’re looking for something FREE, you can read my serial (soon to be an expanded series of novels) The Watchmage of Old New York. Though it ended in February 2014, it remains one of the most popular serials on JukePop OF ALL TIME!